Shut Up You’re Pretty is author Téa Mutonji’s first published book. It’s also the first book published by VS. Books—a new imprint from Arsenal Pulp Press dedicated to publishing work by young writers who are Indigenous, Black, or a person of colour—curated and edited by Vivek Shraya, author of the seminal I’m Afraid of Men (2018). In the eighteen short stories that form Shut Up You’re Pretty a single protagonist, Loli, comes of age in a troubled neighbourhood of Scarborough, Ontario. The immigrant daughter of Congolese immigrant parents, she arrives in Galloway to find immediate kinship with Jolie, street-savvy daughter to a heroin-addicted mother and perfect-mermaid-beauty desired by all. So begins Loli’s Canadian education. Set loose with Jolie in the streets and parks of their neighbourhood, Loli learns the ropes of her new homeland quickly: “the number one rule of the street was to tell men exactly what they wanted to hear.” The girls find fragments of their sexuality in the appraising eyes of the men around them, and in the intimacy of each other. They are children playing at adulthood with the same loveable naivité as Heather O’Neill’s Baby and Nouschka, discovering their bodies as useful commodities and defying poverty by exchanging glimpses and kisses for money and smokes. But when Loli finds herself bereft of the relative safety of their friendship, a more menacing world begins to show itself. In “This Is Only Temporary” a local boy is beaten to death and portrayed as a thug in the media. In “Phyllis Green” Loli becomes conspicuous by the arrival of a second black girl to her school, and must be complicit in her punishment so as to remain “one of us.” In “Ten Year Reunion” a looming family tragedy strikes with no comfort to be found from those who remain. There may be reassurance when communal tragedy strikes, but stability there is not; no one, Loli finds, is always there for you—they are too busy surviving themselves. The stories read like bold and colourful sketches on good paper: rough-hewn and imperfectly constructed at times, they are alive and visceral so that their heartbeat sounds even through the holes left in the telling. Mutonji paints family relationships with a tender honesty evoking Adichie’s Purple Hibiscus, and handles class, gender, and race relations in contemporary Canada with the ease of one who has witnessed them firsthand. Despite Loli’s hardships, as with any good story, Mutonji allows room for healing; and as with any good story, that healing is far from assured. Ready to read it for yourself? 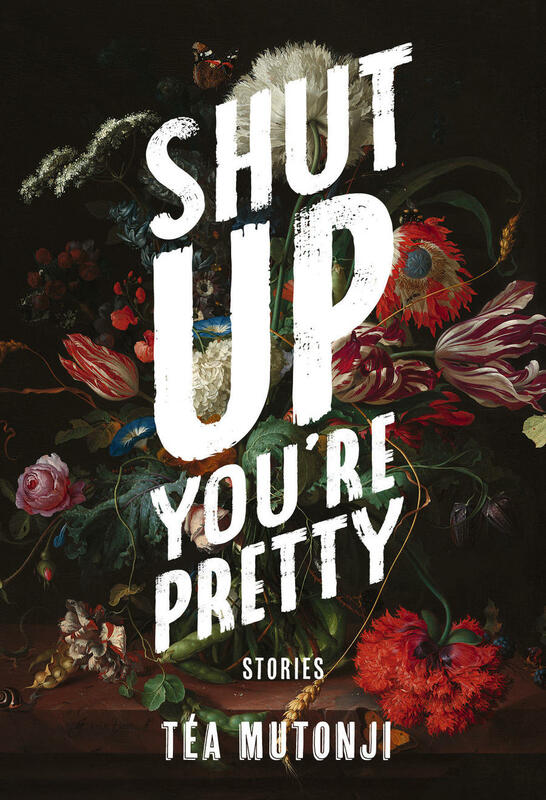 Shut Up You’re Pretty will be in bookstores as of April 1st—or pre-order it now from Arsenal Pulp Press.